On January 14, 2016, Brandon Turnbow from Burleson, Texas was out riding his Harley Davidson and had planned to meet his dad. 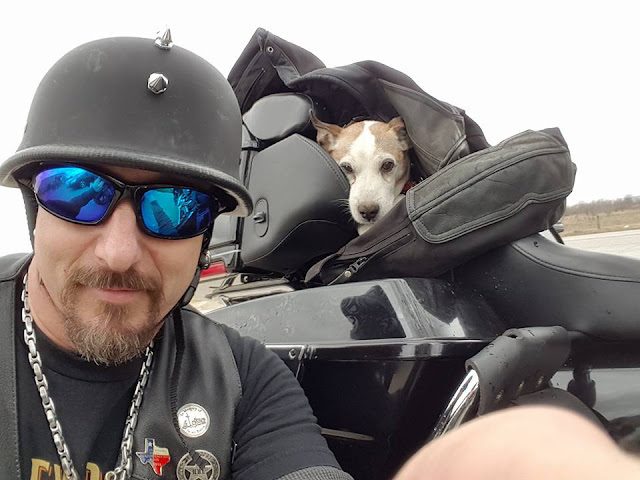 The motorcyclist didn’t think he would to save, rescue and adopt a dog that day, but after witnessing a dog getting abused on the side of the highway, that’s just what this man ended up doing. 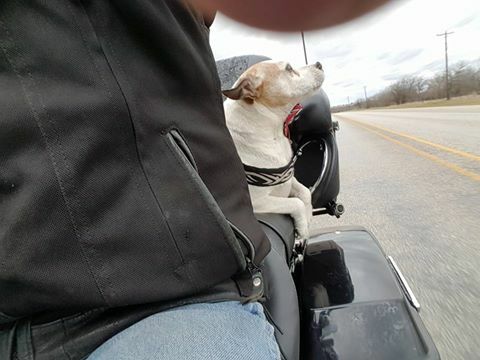 Turnbow was riding on Highway 171 near Cresson, Texas, when something odd caught his eye. After the dog was abandoned, the hero rescuer went to check on the dog. Th pet was on the side of the highway, at risk of getting run over by other vehicles. Turnbow picked him up and quickly rode to catch up with the former abusive owner. “I went after the guy just to give him a number one sign. And I now have a Co pilot- Meet Mr. DAVIDSON,” he wrote on his Facebook post.Mr. Davidson is one lucky dog. He now enjoys a pampered life full of love. When he is not lounging on a comfortable dog bed, he is playing with Turnbow’s other dog named Harley, or inspiring his musically talented new owner to write songs. Thanks to Turnbow and his huge heart, Mr. Davidson now enjoys the good life. The rescue experience inspired the motorcyclist/musician to write this song. You can listen here. 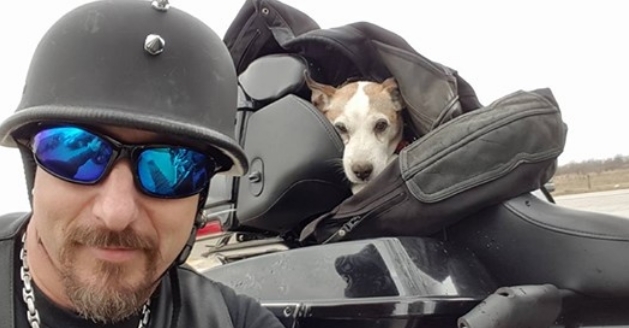 Responses to "Biker Saves Dog Abandoned on Highway and Makes Him Co-Pilot"
Beautiful, what a lovely story. What a great guy! Thanks for caring so much and good luck to you and Mr. Davidson! 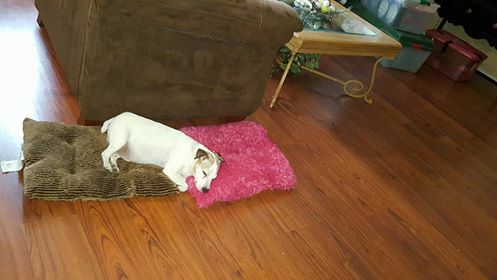 An older Jack Russel, how terrible to treat a pet that way. For any reason,not acceptable. Thanks for the compassion and sharing so we may know not all is lost on the human race. thank you, you're a hero. wonderful! love the song as well very talented man as well as animal lover. Wonderful. I once met an elderly biker (Harley with a sidecar) in the country in Washington state and his partner in the sidecar was an elderly lab. They had been over much of the country together and were the best of buddies. Angels come in many disguises, and you certainly are an angel. You have great respect from me, Sir and Mr. Davidson reminds me of my first dog, too! Well done, Sir! I will never understand those kind of people who could hurt a defenseless animal. the man should of bashed that guys head in!! You have a great big heart and your moral compass pointing in the right direction. Hope you 2 all the best as you have given him a second chance ! That is what a hero looks like. You are a beautiful example of "human kindness'. I hope you have a wonderful life with your sweet roommates, Harley and Mr. Davidson. Thank you from bottom of my heart for rescuing this precious pup and giving him a good home. You rock!! 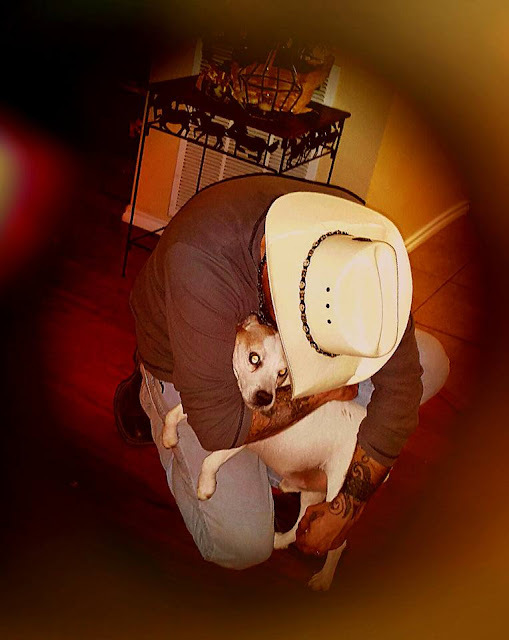 YOU ARE AN ANGEL!THANK YOU FOR SAVING THIS BEAUTIFUL PUP AND ADOPTING HIM .GOD BLESS YOU AND MR.DAVIDSON AND HARLEY FOREVER ... LOVE THE PICTURES AND THE SONG . Since you have promoted him and given him his wings, ... perhaps we can call him "Major Mutley" from now on. God bless you and keep you in his protection. Thank you sir!